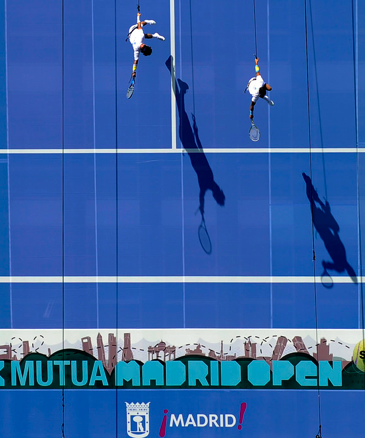 Hangin’ above the crowd: This week, the tennis tour hits the Madrid Open, the most controversial stop on the clay-court schedule. And while much focus has been on Rafael Nadal‘s disapproval of playing in the high altitude before Roland Garros, there’s more to the Madrid cache than a public disagreement with its most famous compatriot. At every opportunity, the Madrid Open creatively and strategically aims to differentiate itself in a very modern way — and the tennis tour is all the better for it. Mastered differences: Madrid has always been unconventional. It changed from hard courts to clay in 2009, at which point the tournament director announced that he was considering forgoing the iconic rust-colored dirt for a thoroughly modern blue. (It never came to fruition, to Nadal and Federer’s approval.) Long before the surface change, the tournament began using models as ball kids during the later stages of the draw, and the fetching — in more ways than one — “kids” continue to raise eyebrows nearly a decade later. (But just to be clear: these are no “kids.”) And just this year, the event was publicized by dangling racket-wielding acrobats off the side of a court-covered building. In all manners, Madrid aims to get people talking with arresting visuals. But the most telling distinction between Madrid and the rest of the tour lies in its most accessible marketing device: their website. It combines vibrant graphics and Flash-based design to convey a unique energy and atmosphere, and there’s even a custom animation at the top that pays tribute to the distinct form of the Caja Magica. It’s fairly obvious that the site isn’t your typical tournament’s digital home, but the most significant deviation from the norm is quite subtle; Madrid doesn’t use the ATP template (nor the WTA template, for that matter) in its design. Take a look at the Rome, Monte Carlo, or Indian Wells sites. Each uses the same architecture and rotating carousel of top stories and images. Madrid isn’t the only tournament to shun the standard — both Cincinnati and Paris are moderately different, for example — but it’s one of the few locations, especially among the big nine Masters Series, to forgo the status quo in favor of something truly unique. And with continuous debate about what tour stop should be bequeathed the “Fifth Slam”, Madrid’s deliberate branding seems like a move for the title. Along with its home page, the tournament also has a vibrant YouTube channel. It’s not unusual for a tournament to post press conferences, daily recaps, and occasional behind-the-scenes content, but — despite YouTube’s history of creating viral phenomenons — few use the video service to genuinely engage the audience. But in the lead up to the main draw, Madrid has done just that. It challenged its Spanish-speaking audience to submit videos proving why they are the ultimate “Super Fan,” which resulted in a plethora of charming tournament tributes. It remains to be seen what sort of content they will provide during the tournament proper, but if this promo video (which features Feliciano Lopez) is any indication, it’ll be just as vibrant and lively as its carefully-cultivated image.